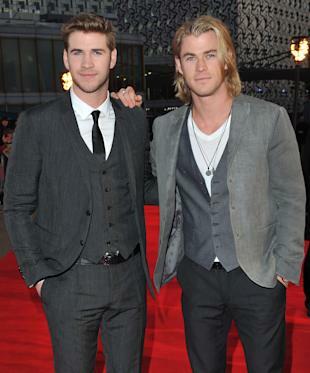 Liam Hemsworth headed to the Toronto International Film Festival this weekend to support his brother, Chris Hemsworth. One person nowhere in sight? Hemsworth's fiancée, Miley Cyrus. "He seemed happy to be out," one partygoer tells omg! of Liam's demeanor. "It looked like he just needed to have some fun." "He was just hanging with friends and mingling with industry acquaintances," adds an onlooker at the Bungalow 8 pop up on the rooftop of the Thompson Hotel. "Nothing more to it than that." The "Paranoia" star was spotted making a low key entrance into said rooftop on Saturday night (where Brad Pitt and Michael Fassbender partied the night before) for a private gathering around 2 a.m.
Of course, all of this is decidedly more interesting when compiled with the fact that Liam, 23, was just in London with big bro Chris, 30, for the world premiere of "Rush." Meanwhile Miley, his "Last Song" co-star and current fiancée, was nowhere to be seen. The "Wrecking Ball" singer is off doing press for her upcoming album. "He is over her and wants to make a clean break," a source told Us Weekly earlier this week. "No more back and forth."